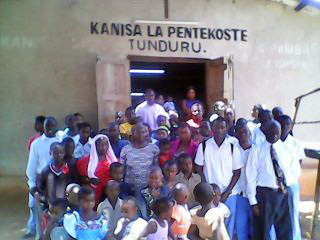 Christians in Tanzania have lost churches, homes, cars and livestock in a series of recent attacks, and some have received physical injuries, reports our sister mission, VOM-USA. In the most recent attack, Muslims returning from worship at a mosque on Friday, October 12, burned a car belonging to Bishop Muhiche of the Tanzania Assemblies of God church. After burning his car, the extremists moved on to destroy the pastor’s church. “Police had to intervene, but it was too late,” said a VOM contact. “They had to use a helicopter to help some Christians escape the attacks. When I went there, we were confronted by the police using tear-gas bombs to scatter the attackers.” Muslims tried to keep the incident quiet by confiscating journalists’ video cameras, but the news was still broadcast on all the local television stations. That same day, in Ushirombo District of Shinyanga Region, Muslim extremists attacked the Reverend Victor Simbaulanga. Enraged by an open-air evangelistic meeting the pastor was leading, the attackers beat Simbaulanga so severely that he had to be hospitalized. A VOM contact is working to have the pastor transferred to a hospital in a safer area so he won’t be attacked again. 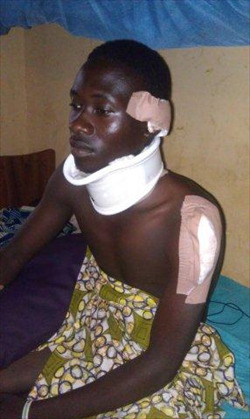 On September 28, Muslim extremists in Tunduru District of Ruvuma Region attacked a Christian medical doctor, Vitalis Lusasi, while he was in his car. They smashed the car’s windows and attempted to burn the vehicle before onlookers intervened. Less than two weeks earlier, on September 17, Muslim extremists reportedly attacked Christians in the same region, burning 60 pigs and attempting to burn six houses. Bystanders helped save five of the houses, but one was destroyed. A few nights later, two Christians’ cars, one belonging to a pastor, were set on fire in the same area (for more information, click here). “No one has been arrested so far in connection with all these wild attacks, probably because 85 per cent of the residents of Tunduru are staunch Muslims,” said a VOM contact. He said some of those who have been attacked are traumatized and won’t talk about their current situation, fearing future attacks. 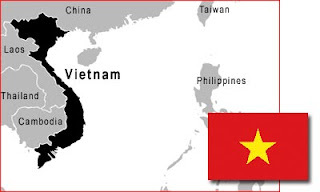 Vietnam is one of the world’s few remaining Communist nations. After gaining independence from France in 1954, 30 years of war were followed by a re-unification of the North and South under the Communist Party in 1975. The Communist Party retains supreme control of all state policy and activity, and the government and military are both tied closely to the party. Strong authoritarian rule brooks no dissent, especially not from ethnic or religious minorities. As a result, human rights violations continue to accrue. Though Vietnam's constitution provides for freedom of worship, the government continues to restrict organized activities of many religious groups. Only government-controlled religious organizations are allowed. The Southern Evangelical Church of Vietnam and the smaller Evangelical Church of Vietnam North are two of the largest officially recognized Protestant churches. Unregistered churches and ethnic minority Christians still suffer harassment, discrimination and, sometimes, outright persecution. When police threatened in December 2009 to beat a man to death and seize his property, which would leave his family destitute, he signed recantation documents. He was asked to prove his reconversion by offering sacrifices to ancestors. In July 2010, a gang of youths attacked and damaged a house-church building in Phu Yen Province. After the attack, police from local and provincial levels came to the area several times to "investigate." However, local Christians believe authorities were only attempting to identify Christians in the village. In November 2010, two Vietnamese evangelists were given prison sentences for “undermining national unity.” They are members of the Vietnam Good News Mission, a fast-growing group of house churches. One month later, police arrested and beat prominent Pastor Nguyen Hong Quang and demolished his Mennonite Bible School, seizing the land for government purposes. Pray that the light of the gospel might banish the ideological and moral darkness over this nation. Pray that the Vietnamese Church will continue to grow and be a light to others. 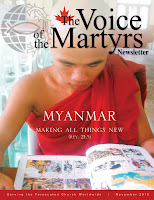 Look for the November issue of The Voice of the Martyrs newsletter in your mailbox this week! Myanmar: Making all things new: Read about "Khin" and "Saya" in Myanmar, and discover how God is doing a new thing in their lives and in their country. VOM around the world: Discover how God is at work in Iran, freeing the imprisoned and building up His Church. Fools for Christ in Laos: Within a country with limited freedoms and harsh restrictions, a growing number of people are choosing to follow Christ. Read how one man became a "fool" for Christ and spent 13 years in prison as a result. Bookstore specials: With Christmas approaching, check out special deals and bundles on a number of VOM resources this month. 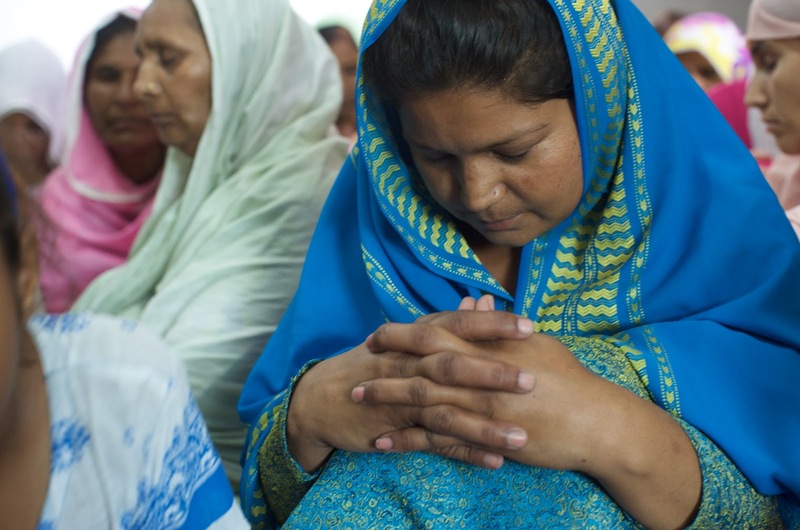 Christmas Blessing Pakistan: This year, we are inviting Canadian Christians to join us in renewing hope and courage in Pakistan. Find out how you can be a blessing this year. We admire people whose professions require a great deal of concentration and focus. The skilled neurosurgeon, the Olympic athlete, and the corporate visionary share a common trait: They are focused. The discipline of focus transcends intelligence, athletic agility, or charisma. Without focus, these people would be merely smart, athletic, or interesting at best. Their ability to stay focused contributes greatly to their success. Developing an earthly focus can bring earthly success, but what about matters of eternity? If you are more focused on the temporary things of this world you will miss the goal. What can you do today to ensure you are focused on Christ and on spreading his good news? In the traditional church calendar, "All Saints Day" and "All Souls Day" stand out in the month of November, set apart to remember the saints of the church and the souls of those who departed this world. It is fitting, then, that the modern church has set apart the month of November to remember and pray for the persecuted Church through the International Day of Prayer for the Persecuted Church (IDOP). November 4 is IDOP Sunday -- a day dedicated to lifting up our persecuted family in prayer. Talk to your pastor about getting your church involved by showing a short video about Christian persecution or having a congregation-led prayer time. You can also join in prayer with a prayer group, Bible study, or as a family. For downloadable resources to guide you in prayer -- including videos, prayer points, and testimonies -- visit IDOP Canada at www.idop.ca. and other Christian sites this year. Hundreds of residents in the north-east Nigerian city of Potiskum are reported to have fled their homes after at least 31 people died in a series of explosions and shootings, reports our sister mission, Release International. Suspected Boko Haram extremists launched a fresh wave of attacks on the commercial capital of Yobe state between Thursday and Saturday. Among the extremists' targets was a church which was burned to the ground. Several other buildings were also destroyed. The violence brought a robust response from the military. Troops patrolled the streets and told residents to stay at home. Checkpoints were mounted across the city, which has suffered almost daily attacks for weeks. As soon as the curfew was lifted on Sunday, the exodus began. Sources say most churches in Potiskum did not hold services last weekend. Meanwhile, in neighbouring Borno state, gunmen attacked the Church of Brethren in Nigeria in Atagara village in the Gwoza area on Friday, shooting dead two people and injuring two others. They also set light to the church building. Pray for an end to extremist violence in north and central Nigeria which has claimed hundreds of lives this year alone. Pray for wisdom for military and political leaders in tackling this crisis. Ask God to bless and sustain His church in this region. Thank God that He is able to do “immeasurably more than all we ask or imagine” (Ephesians 3:20). In our Persecution & Prayer Alert last week, we shared about five Iranian Christians who faced trial on October 15. 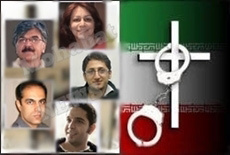 The believers – Mojtaba Hosseini, Mohammad-Reza Partoei (Kourosh), Vahid Hakkani, Homayoun Shokouhi and his wife, Fariba Nazemian – were detained in Adel-Abad prison eight months ago following a raid on a house church in Shiraz. They were charged with creating illegal groups, participating in a house church service, propagation against the Islamic regime, and defaming Islamic holy figures through Christian evangelizing. Fariba was released on October 18 after a substantial bail payment was deposited on her behalf. The authorities refused the property title deeds initially offered as bail, but accepted deeds subsequently offered. The further hearing for these five believers has been scheduled for Thursday, October 25. No verdict was delivered at the hearing held on October 15. Release on bail was also offered to Mojtaba, Mohammad-Reza and Vahid. Their relatives and friends are trying to raise sufficient funds to meet the bail demand. Fariba's husband, Homayoun, was not offered bail. Please pray over this situation. Thank the Lord that Fariba was released on bail. Pray that God will give her and her two children peace at this time. 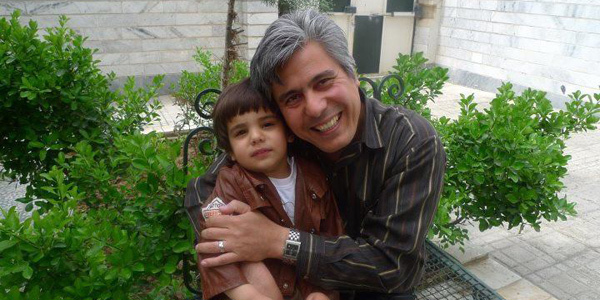 Pray that Homayoun will soon be released. Pray that the hearing on October 25 will be conducted fairly and justly, and that the believers involved will know the Spirit's enabling wisdom. Pray that the five Christians will be acquitted of all charges and released unconditionally. Boko Haram, an Islamic militant group, invaded the off-campus hostel of Federal Polytechnic College on October 1 and murdered approximately 40 students. 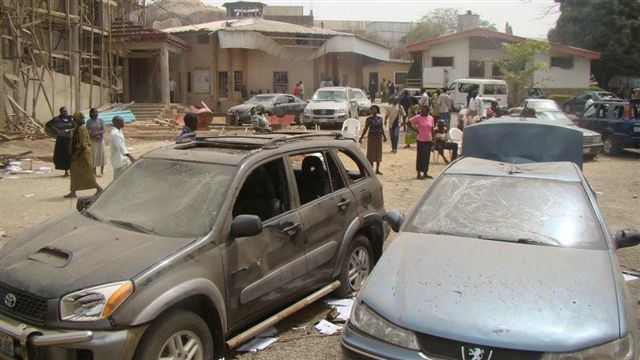 The attack took place in the city of Mubi in remote Adamawa State, located in north-eastern Nigeria. Gunmen reportedly rounded up the students and demanded to know their names. If they gave a Christian name, they were given a chance to deny their Christian faith and convert to Islam by reciting the shahada (Muslim prayer of faith). If they refused and stood firm in their Christian faith, they were either shot or stabbed to death on the spot. Survivors say some Muslims were also murdered, either mistakenly or intentionally. Those who gave Muslim names were required to say a Muslim prayer to prove their faith. If they could not recite the prayer, they were killed. Compass Direct News recently interviewed several survivors of the attack. Below are excerpts from their article. To read the full article, click here. For more information on Nigeria’s persecuted Church, please visit our Nigeria Country Report. 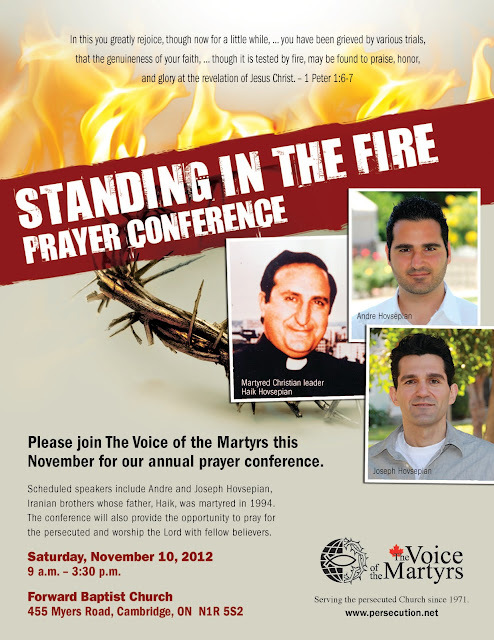 Speakers from The Voice of the Martyrs will be sharing stories from the persecuted Church at various events this November. Please be sure to join us! Sunday, November 4, 2012 – 10:30 a.m.
Sunday, November 4, 2012 – 10:45 a.m.
Sunday, November 4, 2012 – 11 a.m.
Sunday, November 4, 2012 – 11:30 a.m.
Sunday, November 4, 2012 – 6 p.m.
Friday, November 9, 2012 – 7:30 p.m.
Saturday, November 10, 2012 – 9 a.m. to 3:30 p.m.
Sunday, November 11, 2012 – 9:30 a.m.
Sunday, November 11, 2012 – 10:30 a.m.
Wednesday, November 14, 2012 – 10 a.m.
Sunday, November 25, 2012 – 9:30 & 11 a.m.
Wurmbrand sat and quietly wrote down all of the prison rules he had broken. 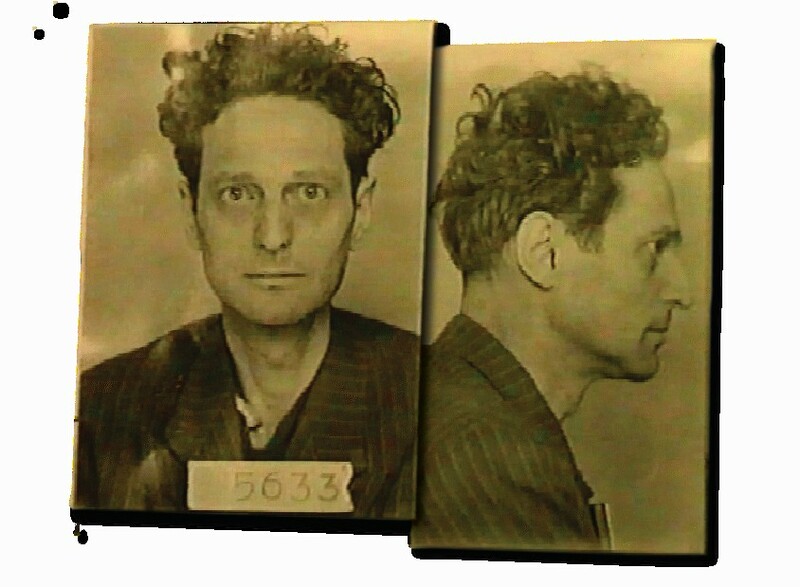 When he was finished, he added one final paragraph: “I have never spoken against the Communists. I am a disciple of Christ, who has given us love for our enemies. I understand them and pray for their conversion so that they will become my brothers in the Faith.” He signed his name boldly at the bottom. In the following months, Wurmbrand spoke of Christ’s love many more times to Lieutenant Grecu, who eventually prayed to receive Christ! Declaring your faith in Christ is simply saying it loud enough for others to hear and receive it. It doesn’t mean you’re obnoxious. It doesn’t mean you must be extraordinarily extroverted. It simply means you are an open book for others to read about Jesus Christ. And you’re willing to read it aloud when necessary. We are often hesitant in our witness for Christ. We don’t wish to offend. We don’t want to be ill received. And yet our taciturn testimony may cause us to miss the opportunity to lead someone to faith in Christ. What would it mean for you to declare your faith in Christ today? To whom should you define and deliver God’s message of grace? The Shouwang Church, which has been worshipping outdoors since April 2011, recently shared the following update. Please continue to keep these brothers and sisters in prayer. Peace in the Lord! On this past Sunday, we held the forty-second outdoor worship service of this year. It was a sunny and cloudy day. As far as we know, including the sister taken to be detained at a hotel on Friday, at least fifteen believers were taken away from home or from locations near the platform. Some of them were released after they were taken away from the platform, and the rest were detained at Zhongguancun Street police station. All of them got released around 13:00pm on Sunday afternoon. Sometimes God seems to hide his face from us; and we won’t be able to see clearly His work on things we prayed for. However, it does not mean that He stops working in this world. On the contrary, this period of time may be the time in which He is going to reveal His great deeds in history. His silence may broaden our vision for us to see His glory in a broader stage. May God open our eyes to see His work, and guard our faith, so that we will be faithful and be used by Him in His historical drama. May peace and grace of the Lord Jesus Christ, the mercy and love of Father God, and the console and guidance of the Holy Spirit, the Advocate, be with each brother and sister of Shouwang Church and all the churches who remember Shouwang Church in prayers, from this time on and forevermore! Amen. Behnam Irani, an Iranian Christian, remains imprisoned as he serves his five-year sentence for crimes against national security. Due to the poor prison conditions, he is in ill health and is suffering from what appears to be inflammatory bowel disease, reports Present Truth Ministries. Behnam Irani has reportedly lost an additional 10 pounds in the last three months, and his skin is turning a yellowish colour. He still has not received medical attention. Even during this trial, Behnam and his wife, Kristina, are standing firm and steadfast in their faith, even encouraging and building up the faith of others. Please continue to pray for Behnam, Kristina, and their two children. You can also send him a letter of encouragement by visiting our letter writing site. Have you signed the petition for Asia Bibi? has been waiting over three years for his wife’s release. 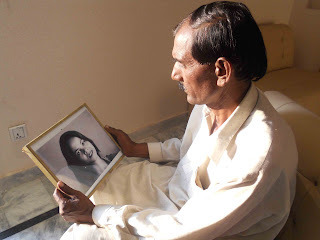 Asia Bibi, a Christian wife and mother in Pakistan, was arrested by police on June 19, 2009, and charged with blasphemy after she engaged in a religious discussion with co-workers. After a lengthy trial, on November 8, 2010, Asia Bibi was sentenced to death by a judge. The judge also fined Asia $1,190 (USD) and told her she had seven days to appeal the decision. Her attorneys filed the appeal promptly, and now wait for the Lahore High Court to rule. If the appeal is rejected, Asia would be the first woman to be lawfully executed under Pakistan’s blasphemy laws. She remains in prison, waiting to hear the high court’s ruling. So what can you do to help? You can raise a voice on Asia’s behalf. Please consider signing an online petition, calling on Pakistan’s authorities to have mercy on Asia Bibi. To sign today, go to www.CallForMercy.com. Despite being injured for his faith, this brother in Nigeria chose to instead be strengthened by the persecution he faced and to continue to evangelize to others who don’t yet know Christ. Watch this video from our sister mission, VOM-USA, to learn how he plans to continue to spread the gospel. So much of what is taught in North American churches implies that when we suffer, it is because we did something wrong, not because we did something right. But in nations where religious freedoms are restricted, I often meet Christians who, when persecuted, follow the example of the apostles after they were beaten by religious leaders: “So they departed from the presence of the council, rejoicing that they were counted worthy to suffer shame for His name. And daily in the temple, and in every house, they did not cease teaching and preaching Jesus as the Christ” (Acts 5:41,42). They refused to retreat. Instead, they rejoiced. Scripture lays it out very clearly: suffering for Christ is normal and even expected. In the Beatitudes, Jesus told His disciples, “Blessed are you when men hate you, and when they exclude you, and revile you, and cast out your name as evil, for the Son of Man’s sake. Rejoice in that day and leap for joy! For indeed your reward is great in heaven, for in like manner their fathers did to the prophets” (Luke 6:22,23). Notice again that suffering is not only normal, but is cause for rejoicing. Have you experienced rejection from family or friends as you have shared Christ with them? On some level, all of us who want others to know about God’s love for them will experience ridicule and rejection.... [But] too many of us let that fear of rejection keep us from telling others about God’s forgiveness and grace. We excuse ourselves from being active in sharing the gospel because we do not want to be offensive to others. However, Paul wrote to Philemon, “I pray that you may be active in sharing your faith, so that you will have a full understanding of every good thing we have in Christ” (Philemon 1:6). We cannot have a full understanding of every good thing we have in Christ if we are not active in sharing our faith. Think about a time when you knew you should talk with someone about Christ, but fear made you stop. Are you more or less likely to share today? Explain. Does realizing that God is loving and patient with you make you more or less likely to share? When was the last time you told someone about the good things God has done for you? Ask God to help you to share about it today, and then choose to take advantage of the opportunity He brings. 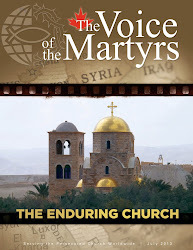 Excerpted from Closer to the Fire: Lessons from the Persecuted Church by VOM-Canada’s Greg Musselman. In Canada, you can order a copy of this book from our online catalogue. You can also purchase this book through Amazon. “Feed my sheep,” Jesus repeated a third time. Only this time, he added, “When you were young, you dressed yourself and went wherever you wanted; but when you are old, another will dress you, and take you where you don’t want to go.” Then Jesus said, “Follow me” (John 21:15-19, paraphrased). Peter turned, and followed where “he didn’t want to go.” He returned to face Nero. When the authorities arrested him, he requested that he be crucified upside down as he was unworthy to be crucified in the same manner his Lord had been. 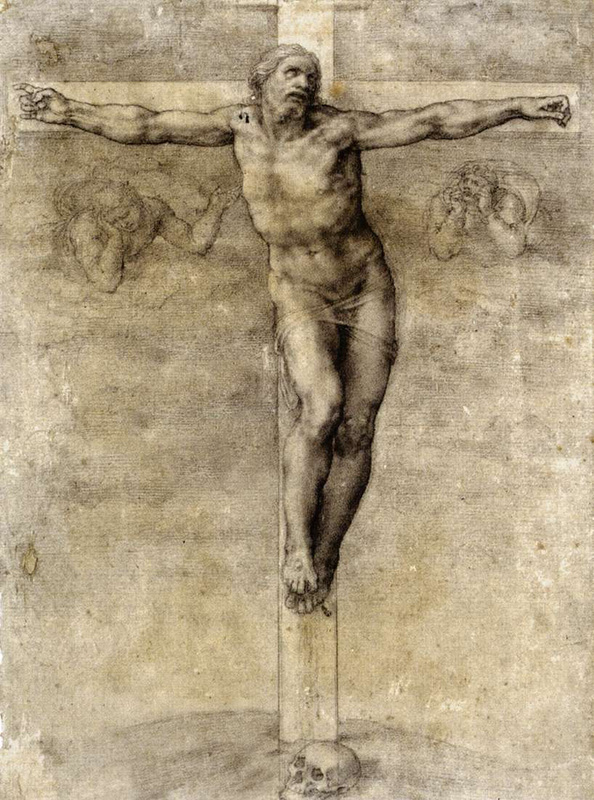 The point of this legend is not to say Jesus truly was crucified a second time. Jesus died and was resurrected once and for all. Rather, the legend reminds us that Jesus identifies with our pain and sufferings so much it as if he is going through them himself. In Peter’s case, the Bible says Jesus’ earlier prophecy referred to Peter’s crucifixion. Who else but Jesus could relate to Peter’s torturous experience? Jesus is the expert on suffering. He knows what it is all about and wants to come alongside us. If there is pain in your life, Jesus understands. If you are hurting, Jesus has been there too. Let him assume your burdens and sorrows in prayer today. Do you live in or near the Cambridge, ON, area? If yes, please join us this November for our annual prayer conference! For more information, or to join our Facebook event, please click here. for his faith in recent years. Much has been written and said about the new season of openness for Christians in Cuba. But those who are able to speak freely say that the persecution is still there, though it is now better concealed, reports VOM-USA. Since the government redefined Cuba as a “secularist” nation from an “atheist” nation in 1992, evangelicals have experienced an era of tolerance, where they meet without permission, but are largely ignored by the government. As an example of this tolerance, one church of around 1,000 members has given birth to 18 independent house churches. These new congregations range in size from 300 to 700 people. But while few Christians have gone to prison for their faith in recent years, the Cuban government still mistreats, marginalize and openly oppose Christians, especially those who live according to their Biblical convictions. 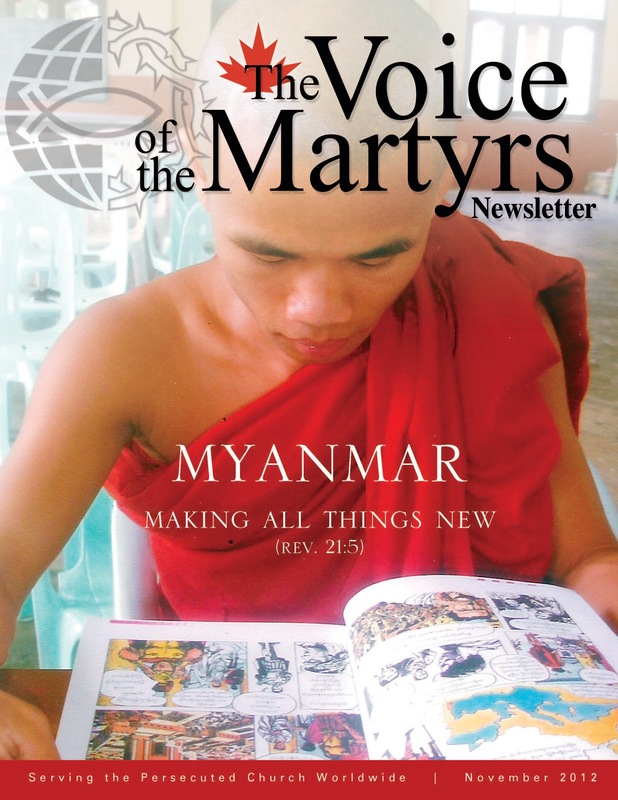 “The persecution now is a closed persecution; it’s hidden,” said VOM’s field worker. Another Christian worker on the island characterized it as discreet. “The pastors tell us they have an enemy without a face. They aren’t confronted directly. Sometimes they don’t know who has infiltrated the church [to inform on them],” said the VOM field worker. Another way the persecution appears is through the lack of Bibles on the island. There has not been a Christian bookstore on the island for 53 years, and Bibles are only imported through churches that are members of the Ecumenical Council (an association of churches that collaborates with the government and includes only 10 per cent of all churches). Christians are also often denied rights and opportunities. Christians are let go from jobs, or not allowed to apply for a certain status of jobs. The best jobs are awarded to Communist Party members. Children are required to renounce Christ and embrace communism in school. Christian young people are often not allowed to graduate from high school or enter university. Is there persecution in Cuba? Certainly, it is less than before. 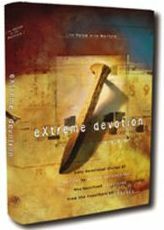 But many of God’s servants on the island experience daily the truth about persecution in Cuba. The enemy of the gospel may be better hidden, but he is still there. God’s grace sustains them hourly as they confront the faceless enemy. Gheorge Calciu spent 16 years in a Romanian prison for speaking against communism. During his imprisonment, he had met Christ, and it would not be his last time behind bars. Having endured the most inhumane of tortures, he was released during a general amnesty and decided to become an Orthodox priest, even though the government had forbidden him to study theology. So he found a way to study for the ministry – in secret. Calciu knew that priests were ordered to side with the communists, but he refused to give in. In 1978, he announced plans to give a series of seven sermons. Seminary students flocked to hear him preach with words that confronted the communist brutality that tried to silence the church. After his third sermon, communists were so outraged that they locked the doors to the seminary. That didn’t stop him. With the doors locked, Calciu preached on the steps. Officials then locked the gates, but many still climbed the walls to hear him. Considered a dissident priest, he was dismissed from his post and was later arrested and imprisoned. Despite torture, Calciu could not be broken. Prison officials made a deal with two convicted murderers to end his witness. Their plans failed when weeks later the two murderers refused to kill him. In 1983, secret police transferred Calciu to a prison where he was told he would die. In reality, he was released and spent the next two years under house arrest until he was exiled to the United States, where he died of cancer in 2006. Calciu had a courage that demonstrated a power only God can give (1 Cor. 2:3-5). It is not our cleverness of speech that God wants, but our obedience to be His mouthpiece, even in the face of rejection, criticism, prison, and death. A VOM partner recently reported that a dear friend and important Christian leader in Iran has died after a long illness. "Glory be to God because [my friend] is now in His arms and without pain," wrote the VOM partner. The man who died leaves behind a wife of just a few years. "Please pray for us," the VOM partner asked, "because he was our best friend, confidant and co-worker. I have personally known him for almost eight years, and for all of us it's very difficult. In Iran, church is more of a family than a place we meet, and we really feel that we have lost our brother. His place is so empty without him." Praise God for this man's life, and thank God for the people he touched through his work for Christ. Please lift up the Christian leader's wife, our partner in Iran, and all believers who share Christ in Iran. To learn more about Iran’s persecuted Church, visit our Iran Country Report. Can God really suffer? The thought seems preposterous, perhaps even unbiblical. The question of whether God can actually suffer has been dealt with in what has been called the doctrine of impassibility. This doctrine holds that God cannot suffer. Historically, the position has been very predominant in Christian thought. While recognizing Christ had suffered din His body, the early church fathers contended that God Himself did not. But in the past few decades there has been a turning away from the traditional view of impassability and a move towards developing a doctrine of divine passibility or perhaps a redefinition of impassibility itself. We opt for a redefinition of impassibility, suggesting that God can never be forced to act contrary to His character and other attributes revealed in the Bible. In line with God’s omnipotence and immutability and the revelation of God through Christ, we can assert that God chooses to suffer. He is never the helpless victim of circumstances, actions, or emotions. He cannot be unconsciously or unwilling moved. He suffers because He chooses to love. But He is never overcome by emotions or emotionally out of control. God is compassionately able to relate with those who suffer pain in all of its aspects but never in a way that contradicts other aspects of His revealed character. Incarnationally. When God became man incarnated in the person of Jesus Christ, He experienced in full measure the physical suffering that goes along with being a human being in a fallen world. In Christ, God suffered with and for us. Relationally. God suffers because of His interaction with His people. In Psalm 78:40-41, we read of how God’s people grieved and pained Him. Jesus wept over Jerusalem as He saw her blindness and stubbornness (Matthew 23:37-39; Luke 19:41-44). Throughout the Scriptures, we come across various illustrations of the story of man’s relationship with God – a story of human rejection and divine suffering. When His people suffer, God suffers. Glenn Penner, former CEO of The Voice of the Martyrs Canada, passed away in January 2010. Glenn was passionate about researching and teaching the theology of persecution. For more of his writing, you can check out his book, In the Shadow of the Cross. 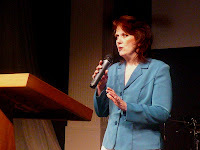 VOM founder Rev. Richard Wurmbrand faced severe persecution in Romania for his belief in Jesus Christ. During his years in prison, Richard grew in his love for God. In this video, discover Richard's thoughts about keeping his faith in Christ despite harsh torture and imprisonment. For more videos about our persecuted brothers and sisters, please visit our multimedia site. The cold, dark prison cell was crowded with Romanian Christians who were determined to bring the light of Jesus into the darkness. One of these prisoners was a Jewish believer named Milan Haimovici. “Such a lie,” the professor laughed. “Show me how he smiles.” Milan graciously conceded. He was shorn and only skin and bones, with dark circles around his eyes. He was missing teeth and was wearing a prisoner’s uniform, but such a beautiful smile appeared on his lips. His dirty face shone. There was so much peace, so much contentment, and so much joy on his face. A smile is a natural human expression of confidence, peace, and contentment. A smile during pain and suffering and even agony can give supernatural evidence of God. If Jesus Christ, God’s own Son, is really living in our hearts, then some of us need to inform our faces of the good news! In church, we sometimes sing hymns like funeral dirges—our thoughts a thousand miles away from our words. What does your face reveal about your relationship with Jesus? Are you a witness to others who pass you by on the street? Do you attest to Christ’s contentment in your heart? Or is your brow furrowed with worry and your lips constantly pursed? Ask God to help you be aware of your silent message and to fill you with his joy. gathering to worship outdoors since April 2011.
praise God and give Him thanks. Thanksgiving Day, celebrated by Canadians this weekend, is a wonderful time to reflect on and remember the Lord’s blessings in our lives. It is a common practice with many families, including my own, to share one thing we are thankful for before enjoying the Thanksgiving feast. As I reflect on this practice, I am reminded of a house church pastor in China who started a service by asking each person to tell what their wounds for Christ were that week. Each person shared how they had endured some form of suffering because of their allegiance to Jesus. After this was completed, the pastor led them all in worship as they sang songs of praise and thanksgiving to God for His faithfulness. I do not tell you this to make you feel any sort of guilt for the times of thanksgiving you have enjoyed in past years. However, I do hope to raise your awareness of the faithfulness of God in the midst of circumstances in which we don’t naturally give thanks. This Thanksgiving, do take the time to ask your family and loved ones what they are thankful for. But I also encourage you to ask what their wounds for Christ are. For many of us, this may be difficult to answer, but it is a question we need to ponder. Instead of being thankful that we have not had to endure hardship for the sake of Christ in our country, should we not feel some uneasiness over that? Are we free from hardship because we have chosen to keep our faith private, not willing to risk a date with the fiery furnace (see Daniel 3)? And if so, is that really something to be thankful for? 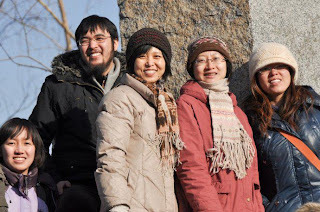 May we, like the house church pastor in China, know the complete faithfulness of God as we seek to live for Him in whatever circumstances we are called to minister. by writing her a letter. A teenager in Tanzania was recently sentenced to two years in prison after being accused of desecrating the Qur'an. Eva Abdullah, 17, converted to Christianity from Islam three years ago. Her parents disowned her after her conversion and a group of radicals in her hometown of Bagamoyo tried to persuade her to renounce her Christian faith. When she refused, they falsely accused her of desecrating a Qur'an. Many Christian leaders were afraid to defend Eva because of the Muslim dominance in the district. On July 26, Eva was sentenced to two years in prison by a judge who was allegedly bribed by the Islamic militants. Please write a letter to Eva, reminding her that Christians around the world are concerned about her situation and are praying for her. Please note: When writing a letter, never mention the name of the source of your information or the name of any organization such as Voice of the Martyrs or Prisoner Alert. It is not dangerous for a prisoner to receive letters from individuals, but if an organization is mentioned they may be accused of links with “foreign organizations” and receive harsher sentences. Also, please do not state anything negative about their government. For more information on letter writing, click here. 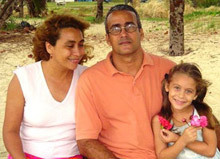 To create a letter using phrases in Eva’s own language, please visit www.PrisonerAlert.com. Every year, Christians in more than 130 countries join together in prayer for our persecuted brothers and sisters through the International Day of Prayer for the Persecuted Church (IDOP). This year, IDOP Canada is observing the day of prayer on Sunday, November 4, 2012. Last year in Solo, Central Java, the Bethel Full Gospel Church faced a violent confrontation that would test them as a congregation. “On Sunday, September 25, 2011, Pastor Sigit Purbandoro from Surabaya had preached about ‘God’s Help’ from Psalm 121:1–8. The prayer of blessing was uttered at 10:45 a.m., and believers left their pews and walked out from our church hall. The singers and music band were sending out the believers with praise and worship songs. Suddenly, a loud explosion shattered the joyful atmosphere. “I ran to the centre of the stage. I thought the blast sound came from the sound system speakers, but then I saw thick white smoke coming from the main door. This smoke had a sharp powder smell. I ran to the source of the white smoke. There was blood on the floor, and some were crying out hysterically in pain. “I found a dead body and realized that this was the suicide bomber. The deacons helped me secure the church building. The church’s security personnel closed the church’s gate so that no outsiders could come into the building. In 15 minutes the church deacons managed to evacuate all 30 of the victims to the hospital. None of the wounded died, only the bomber. Fourteen of the 30 victims had to stay in the hospital to undergo operations. “I left the hospital and returned to the church. I sat on a chair not far from the dead body of the bomber. After looking at the bomber’s body for a while, I thought, Should his life end tragically, wasted like this? At that moment there was no hatred or revenge in my mind, but only love for this bomber who had chosen the wrong path. “Based on the video recorded by the church’s closed circuit television, the bomber had come into the church’s hall through a small side door wearing a white long-sleeve shirt, black trousers, a cap and sunglasses. He had a small bag slung over his chest. “When the bomber pressed the button, shrapnel spread out. A piece of sharp pipe as big as an adult’s fist ejected and pierced the church’s ceiling. If it had hit believers, they would have died instantly. But none of our believers died. The happiest thing is that all the victims suffered but are not angry at the Lord. They were harmed, but they forgive their enemies. “Church member Yulianti, who is 74 years old, told me, ‘I’ll stop attending church meetings for a while.’ But on the following day she said, ‘After I’m healed, I’ll go to church again. I’m not afraid anymore, because Lord Jesus is everything.’ She said, ‘Pastor Yo, through this way I can testify how great our Lord Jesus is. And this is the chance to show to unbelievers that I’m not afraid to walk with the Lord Jesus and show them that I forgive those who have harmed me.’ This is faith which is built on the Rock. 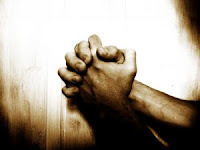 For other testimonies and resources to guide you in prayer, go to www.idop.ca. People expect that because I have been in jail I will be a melancholic man, will speak only sadness, and that they will see it on my face, how crushed I am. I know a story of joy and triumph – that is, a face of God. It was such a beautiful story. In prison, outside our cells stood the wardens with sticks and outside the angels were sent to protect us. The gray walls of the cells shone like diamonds. There was such fire of love, flames of love and of goodness in this cell that Christians rejoiced. Some of them danced for joy. And now you in [the West] have the same God. You do not have to be in a Communist prison to have a shining face. Faces can shine without being in a Communist prison. If I were a painter, I would paint the shining faces of Christians in prison. It was quite an achievement for God to make a face shine there because we were unwashed. The faces shone with beautiful smiles. Must we wait for such circumstances to have shining faces or smile? Jesus on the cross was not beautiful, but this, also, was a face of God. That was not the only face of Jesus. On the third day, He rose and was so beautiful and shining that the Roman soldiers could not look at Him. They found out He had another face. So, I might be very ugly today, but this, my ugly face, is also the face of a God who loves me and has taken upon Himself all the ugliness of human life and human things in order to save us. Excerpted from “The Faces of God,” a sermon included in the Wurmbrand Sermon Series DVD. You can order a copy of this 2-DVD set from our online catalogue. 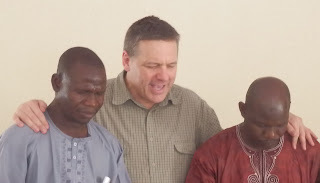 Earlier this year, VOM staff visited Nigeria to meet with and encourage Christians who have faced persecution. Three women they met with are now widows after their husbands were killed for their faith. In this video, you will hear not only their stories of loss, but also their testimonies of courage and strength to overcome and to forgive. I recently came upon C.S. Lewis' essay "The Efficacy of Prayer," which I feel asks some important questions and offers some valuable insights about the nature and purpose of prayer. As usual, Lewis wrestles with issues of faith by asking questions instead of offering immediate or easy answers. His main question in this essay is "Why do we pray?" – which connects to other questions such as "What good are our prayers, anyway?" and "What do prayers change?" Prayer, implies Lewis, is not an activity that we perform in order to change God's will, but a way for us to submit to it. So, when we gather together and pray for the persecuted, we are not praying that God change his will for the lives of our brothers and sisters who are suffering for their faith. To do so would imply that we don't believe that their suffering is in accordance with His ultimate plan of redeeming mankind. Instead, prayer is a way for us to acknowledge that every life is in the hands of a Lord who is wholly good, loving and divine. His mind is not one that can or should be altered by our suggestions and pleas. If it could be changed – if God acted according to our will – what need would we have for Him at all? And why would believers choose to sacrifice their lives for Him? Wouldn't all Christians be able to just sit back, safe from harm, and simply use our prayers to convince him that all of this persecution business wasn't really necessary? Prayer is not about changing God, it is about His changing us – His helping us to see past our human perceptions and impulses. Although the story of a believer beaten or tortured for his or her faith might compel us to cry out to the Lord for this suffering to cease, He asks for us to also pray that, even if it endures, we will have the strength to entrust it to His purpose. Likewise, He calls on us to pray that the victim will also experience this strength and trust in Him. The human life is made up of actions, and the Christian life is characterized by a commitment to make all actions reflect our faith. Lewis emphasizes that prayer is an action – it is a deliberate deed, a movement, a response. It is done because it has an effect. "It is not really stranger, nor less strange," he says, "that my prayers should affect the course of events than that my other actions should do so. They have not advised or changed God's mind – that is, His overall purpose. But that purpose will be realized in different ways according to the actions, including the prayers, of His creatures." When we pray, just as when we commit any other action in faith, we are always affected. We are blessed; our lives are filled with more joy, more peace and more hope than they would be if our actions had another purpose. Prayer helps us to know love as it's meant to be known, receive grace as it's meant to be received and, by doing so, teaches us to give both of these things as they are meant to be given. It enables us to connect our actions with God's overall purpose, which is to redeem us and make us holy.